THANK YOU for all of your contributions. Although the blog has been quiet due to personal circumstances, the scarf has continued to grow, and we have continued to gain more followers online. So, the personal: I lost my job in June, and have been focusing on doing what I need to do to survive and find gainful employment. I am happy to say that I am beginning to emerge from the other side of those difficult times, AND I would like to say that continuing to receive all of your beautiful scarf donations has given me solace and strength. So thank you not only for your contribution to this charity, but also personally, from me, for your graciousness in supporting this endeavor. As you may recall, we decided to scrap the Guinness Book of World Records goal, because the requirements were too restrictive. I wanted to be able to take anything and everything that was sent my way. 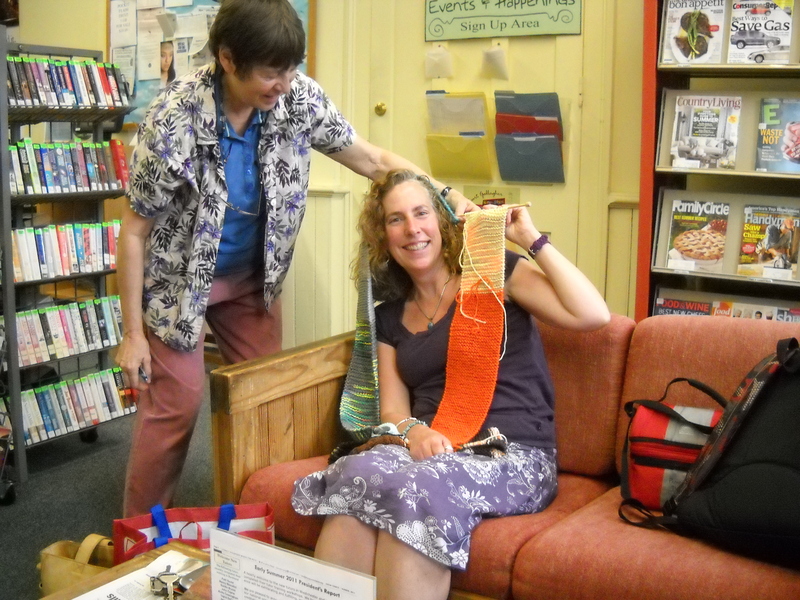 Project Scarf on its way to the grand unveiling! 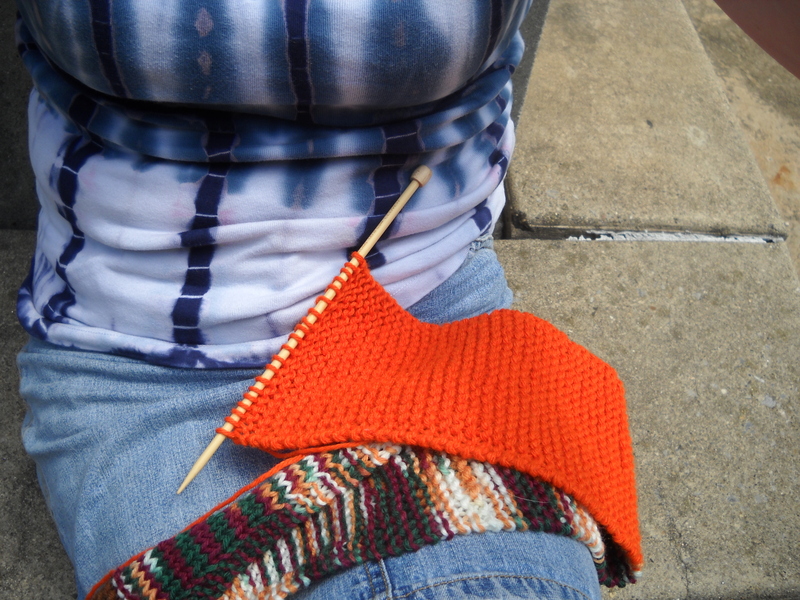 As of yesterday, the scarf was 156 feet, and 7 inches, and I still have a few more segments to attach. 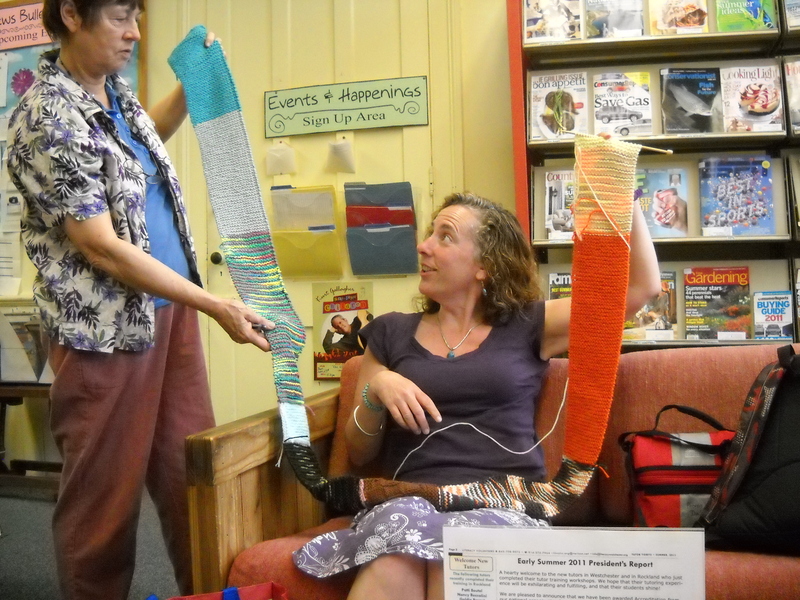 I brought it to my KnitLit group and we had a grand unveiling, stretching it out to its full length on the third floor corridor of Haverstraw Middle School. 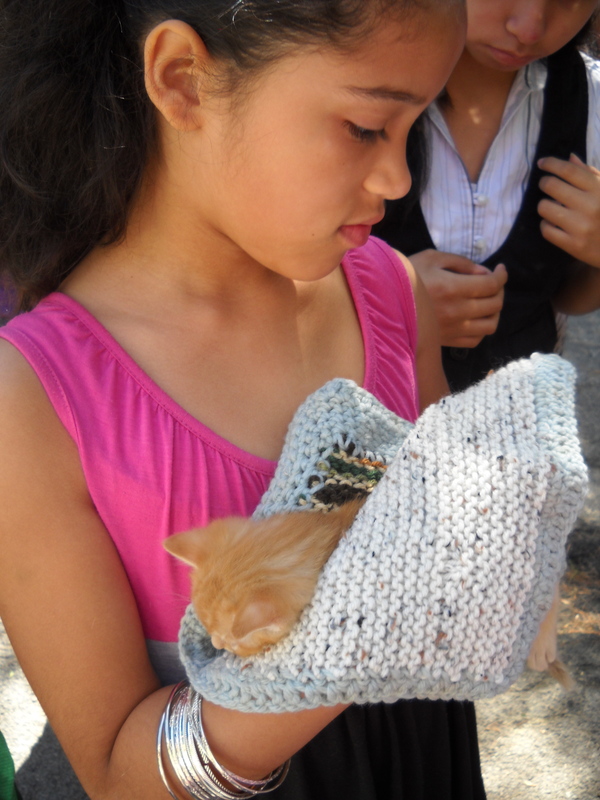 I am going to try to upload the video to our Project Scarf Facebook page, so you can check it out there. So…I have come to a big decision. Rather than having these beautiful scarves sitting around all summer until next season, I would like them to go out into the world and be of use to people who need them now, while we still have some winter left. I have contacted People to People, which is a local organization that serves more than 1,200 families in need right here in Rockland County. They provide food, clothing, and other essential services. Their motto is “helping our neighbors through difficult times with dignity”, and they do just that. They are a remarkable organization, and they have told me that they will be happy to take as many scarves as I would like to give them. So I will finish attaching all the sections I have, in order for a final total length count and a photo, then I will dismantle them all and take them down to People to People. I will also include information about the project, website, and contributors, so they will understand how many loving hands have graced this project. Everyone's a star in KnitLit! After that, I will be happy to keep going, and start all over again, so those of you who want to keep sending scarves, please do! 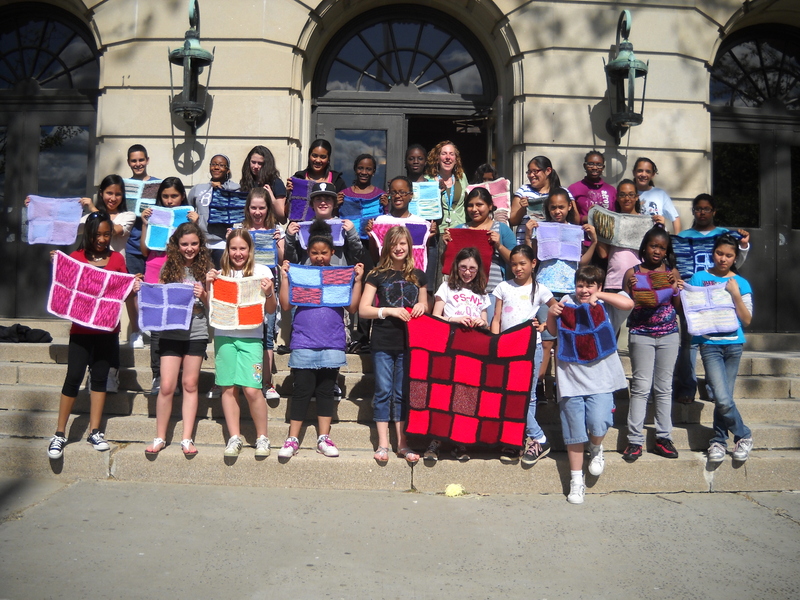 Thank you again, everyone – I am truly honored that you have wanted to participate in Project Scarf. Stay warm, and keep on knitting! Check out this great article on craftivism featuring Project Scarf and KnitLit by Leila Cook in the August 1-2 issue of OM Times. 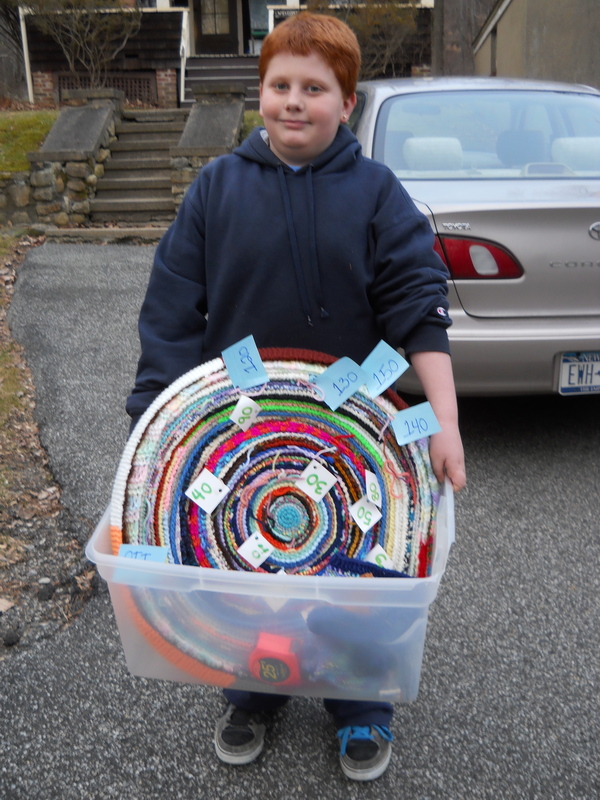 Titled “Project Scarf: Changing the World…One Stitch at a Time” it is in the “Movers and Shakers” section, dedicated to individuals and organizations whose examples and actions make this world a brighter place for all of us. I would like to thank the AMAZING Leila Cook, for giving me the opportunity to reflect and share, and for supporting Project Scarf and helping me to get the word out. Also, heartfelt thanks go to DeZengo Moore of Humanity Healing, who publishes OM Times. 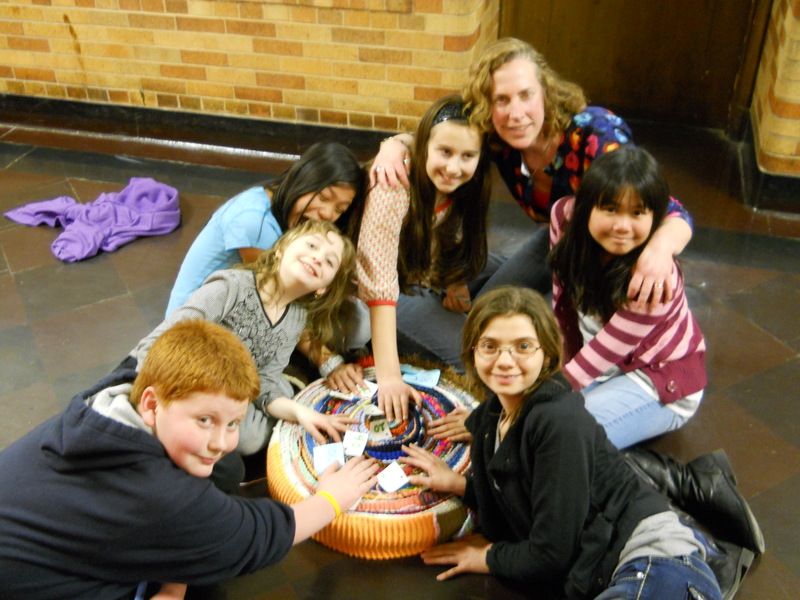 Humanity Healing is a Nondenominational Network committed to Physical, Mental, Emotional and Spiritual Healing and Growth through Education and Spiritual Activism. Click here to read more about them…Please check them out! 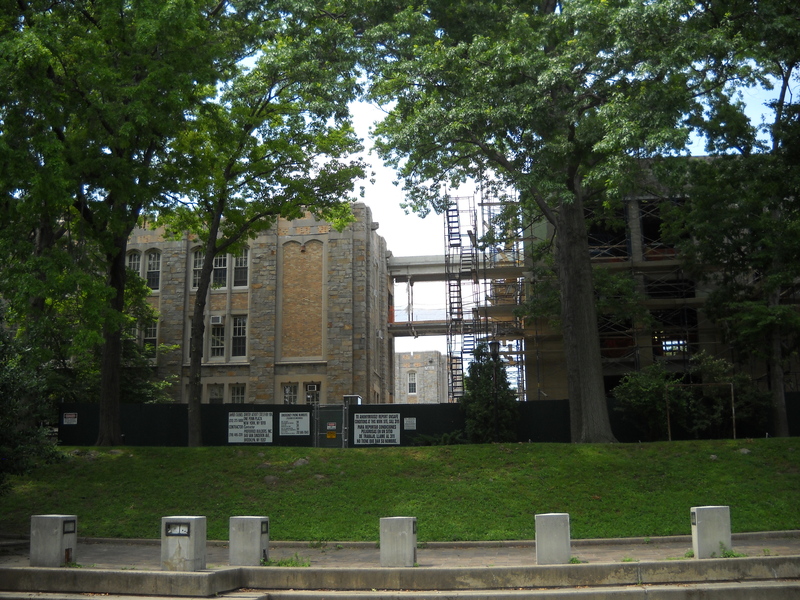 I had to say goodbye to my dear Haverstraw Middle School, having become one of the casualties of massive layoffs in the North Rockland School District. At the same time I am turning my face toward the sun, and the new beginnings that are being forced upon me. An opportunity to dive into crafting again (click here to check out some of my work), grow the KnitLit Program, teach knitting, and “scarf it up” on Project Scarf. That said, I have been delinquent in keeping you up to date on the doings of Project Scarf, which has been progressing nicely! I take it with me everywhere now, and it’s becoming quite a conversation piece, even though it’s still just a “baby”. Today was the day we came up with the official name “Project Scarf”, after days of frustrating internet searches to discover that apparently all clever names are already in use – so we decided to just keep it straight and simple. 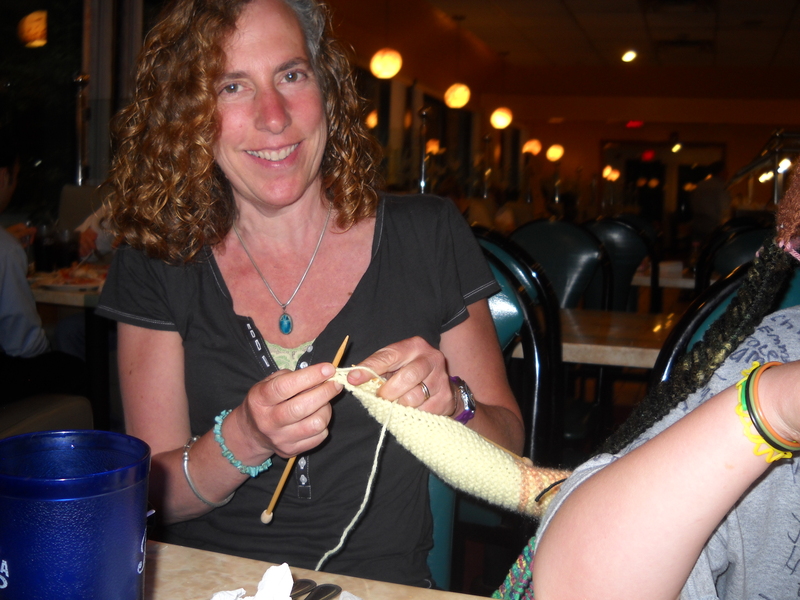 Lesson learned – remember to ask someone to snap the picture – short of growing an extra limb, it’s virtually impossible to photograph myself knitting. 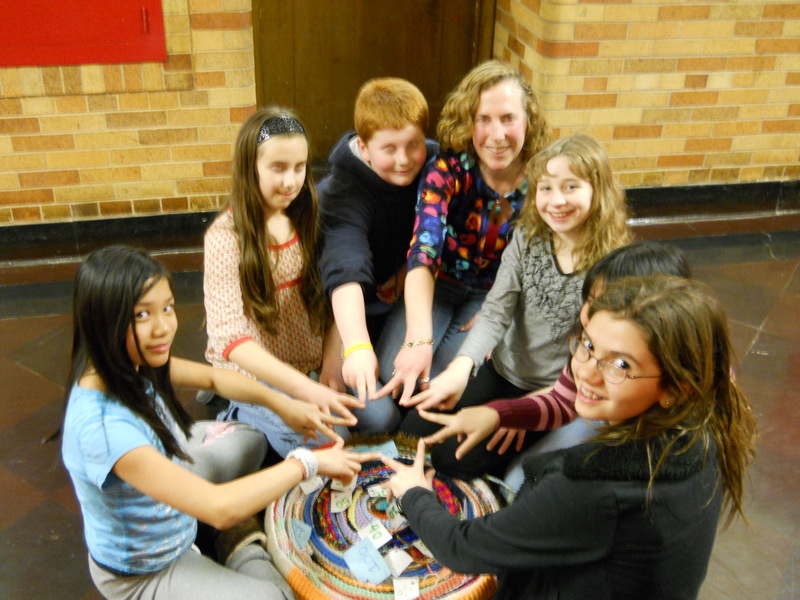 Project Scarf visited HMS during Final Exams while I was reading questions one to one to a 5th grader. 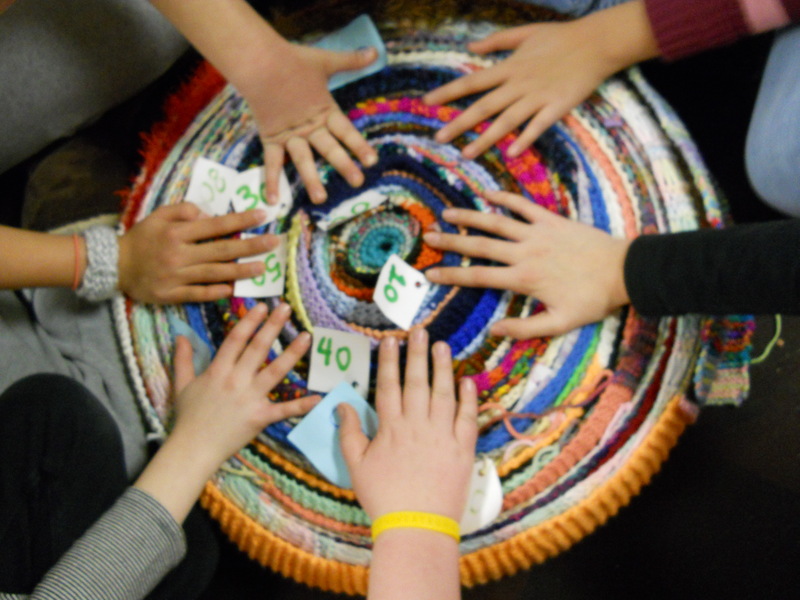 The knitting seemed to have a very calming and focusing effect – student did a GREAT job! After school, Project Scarf paid a visit to the Tomkins Cove Library, where I am a member of the Board of Trustees (and both of my kids get off the school bus there). We got a little silly with it, but were able to spread the word to lots more folks! The Scarf tends to inspire a great deal of silliness – I’m all for that. I think we all need to get silly a good deal more often. Length by Day’s end: I was a slacker today – no clue, as I forgot to measure it. 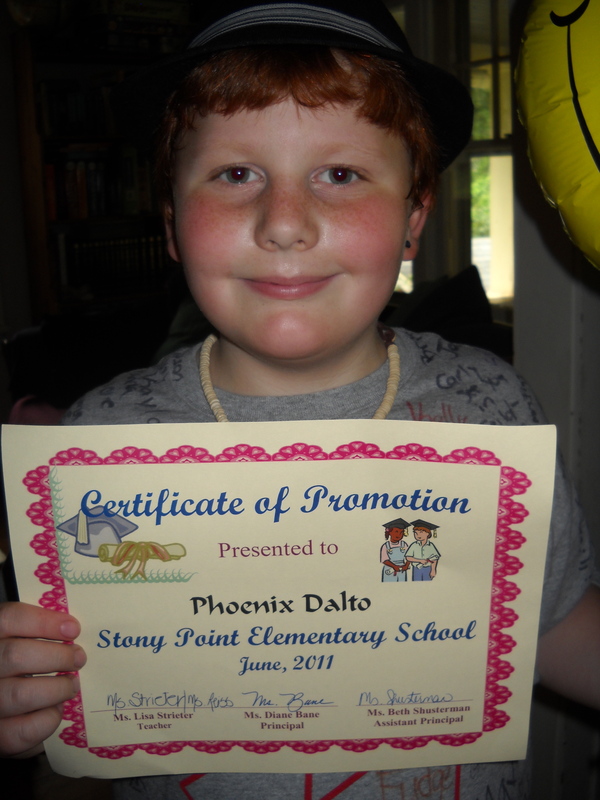 Congratulations Phoenix! 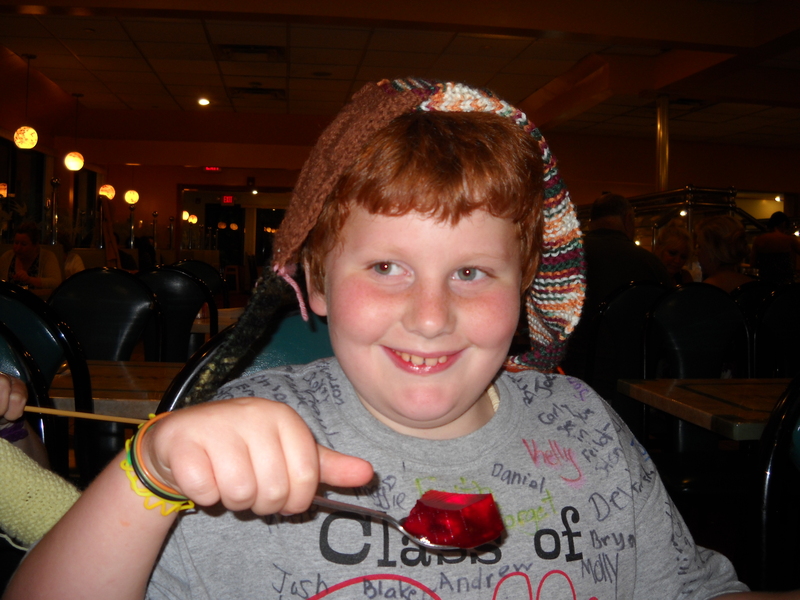 Look out world. 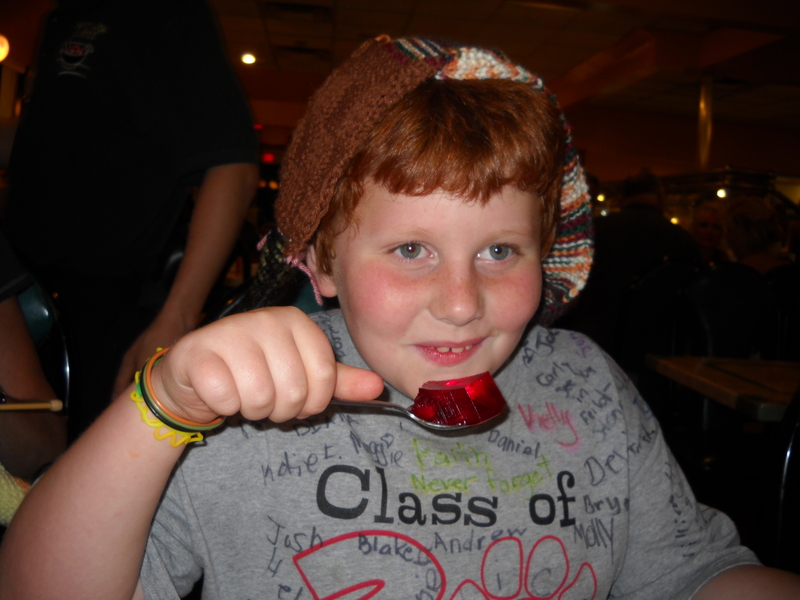 In the evening, we celebrated at one of Phoenix’s favorite restaurants, The Hard Wok Buffet, in New City. 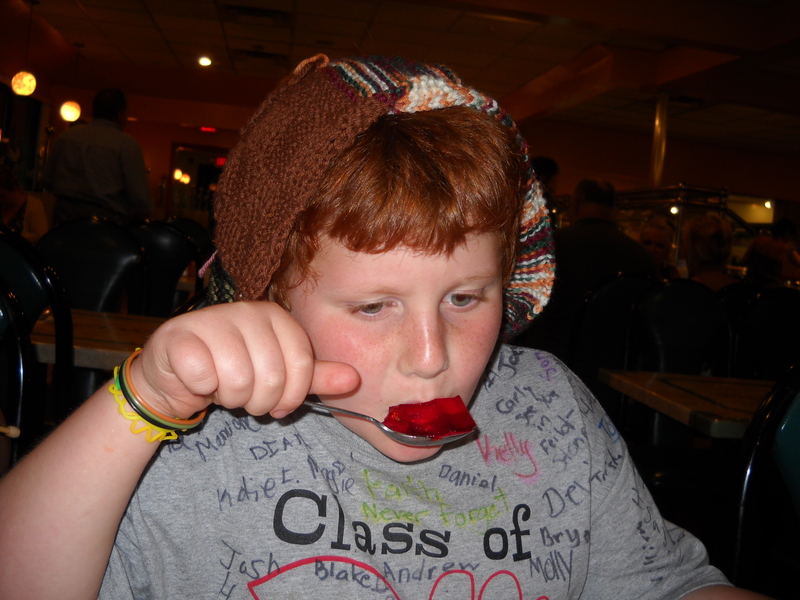 More silliness (with jello, this time) ensued…everyone should have a scarf on their head while slurping jello, don’tcha think? My day was not complete. A momentous day, and sad: I say goodbye to HMS after 8 years there, and 11 years in the district. My normal anticipation of the beginning of summer vacation was tempered this year with sadness and some anxiety, though for the most part I feel hopeful and confident that I can create an interesting new chapter. Fittingly, I taught a bunch of kids to knit (I had a group of 3 boys and 2 girls), and they all got to bless Project Scarf with a least a few stitches! 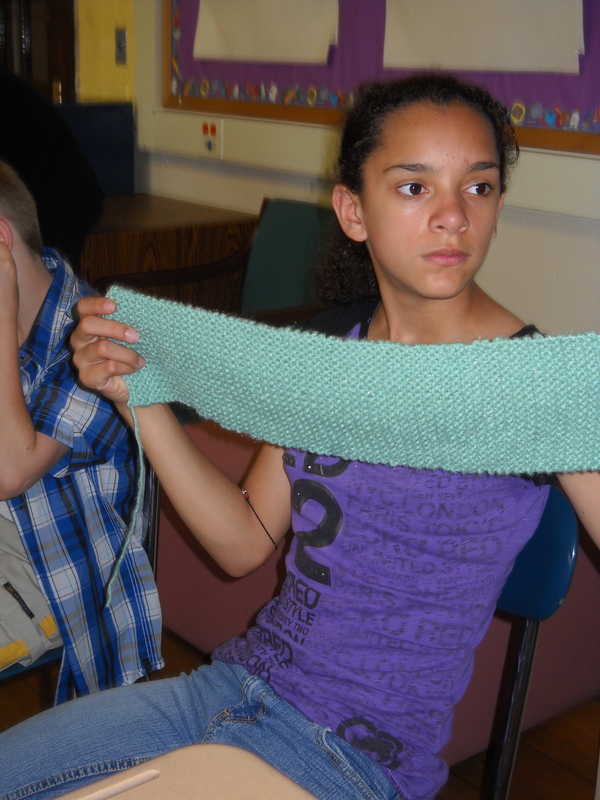 My observation of the day was the observable benefit of knitting in certain students who are normally quite rambunctious and easily distracted (NOT Kaitlin – she’s a superstar!). I saw amazing amounts of focus, concentration, and persistence. Students needed to sit up straight and be aware of their limbs..attention could not (and did not) wander. 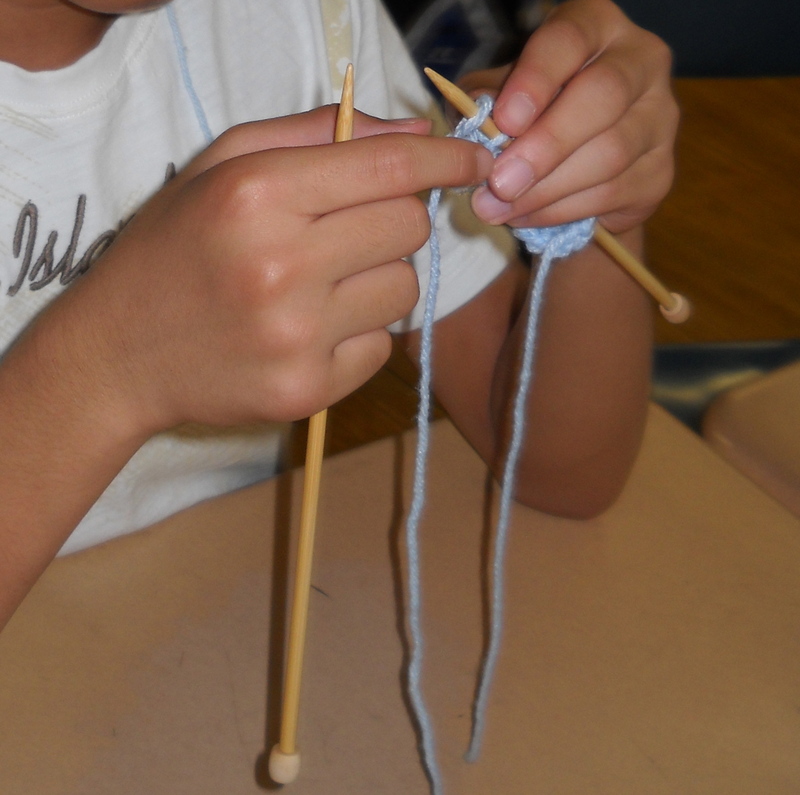 What a feeling of accomplishment these students had when they knit a complete row on their own! decided today that I will have several scarves in progress already on needles in ziploc bags, so newbies can simply learn the knit stitch and accomplish at least a row or two for Project Scarf. Hopefully they will come away from the encounter with a newfound inspiration and curiosity to learn more, and head straight to the craft store for needles and yarn!